I tend to think of braises and stews as being autumn and winter foods. 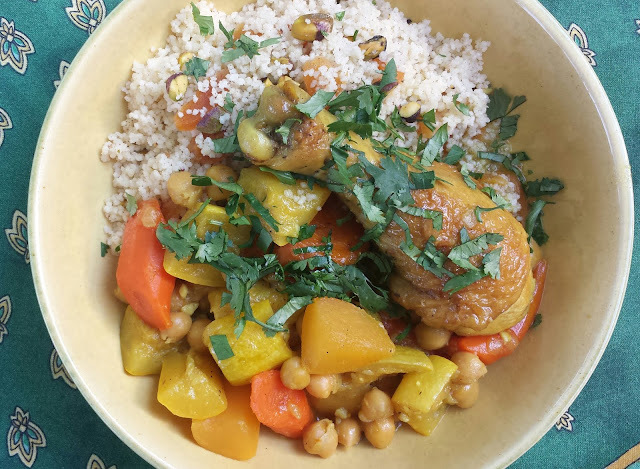 But recently as I looked at some of my farmers' market vegetables I realized that I had the makings of a traditional Moroccan-style couscous of chicken and vegetables. I have always thought it was odd that these stews often feature a combination of what I think of as winter root vegetables (carrots and turnips) and summer squash (or zucchini). But there they were...young carrots, golden turnips and yellow squash...all in my market basket at the same moment. And I have to admit that as we sat down to our hot, fragrant and spicy bowl of stew and couscous on a recent rather sultry evening, the food seemed to be a perfect (although unusual for me) match for the day. I should say up front that the dish I prepared is by no means an authentic couscous. An authentic couscous would use dried (as opposed to canned) chickpeas...and it would definitely not use our ubiquitous instant/pre-steamed couscous. A true Moroccan...or Algerian....couscous is prepared in a special pot called a couscoussière. The pot is constructed like a double boiler-style steamer. The bottom portion is a typical stewing pot and the top piece has a perforated bottom so that the couscous (a dried granular, semolina pasta) can steam over the fragrant stew—taking on the perfume of the spices in the stew as it cooks. The cooking process takes two or three hours and twice during that time the couscous is turned out onto a large pan (like a paella pan) so that it can be hand "fluffed." 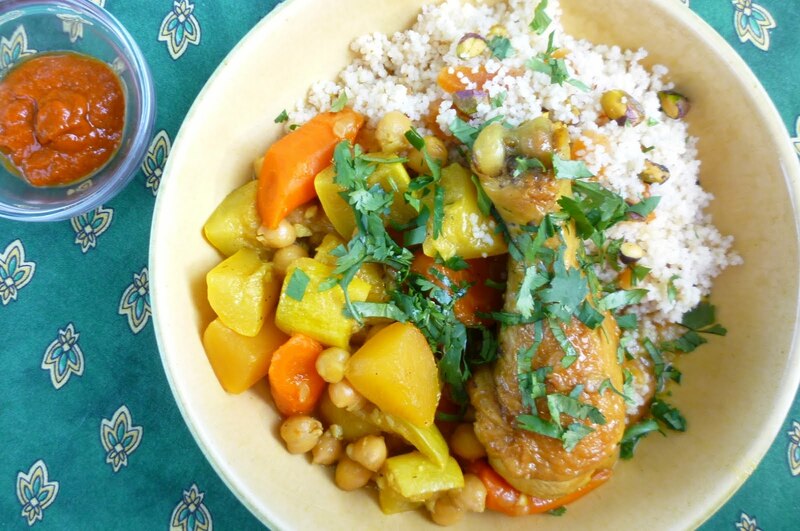 I had the pleasure of participating in the making of a traditional Algerian couscous many years ago while I was working in France. It took the better part of an afternoon, and although I enjoyed myself immensely, when I want to put dinner on the table here at home, I am grateful for our pre-steamed couscous—which only takes about 10 minutes to make (and is pretty much all that one finds at American grocery stores). The preparation of the "stew" portion of the couscous follows all of the basic rules of braising and stewing. 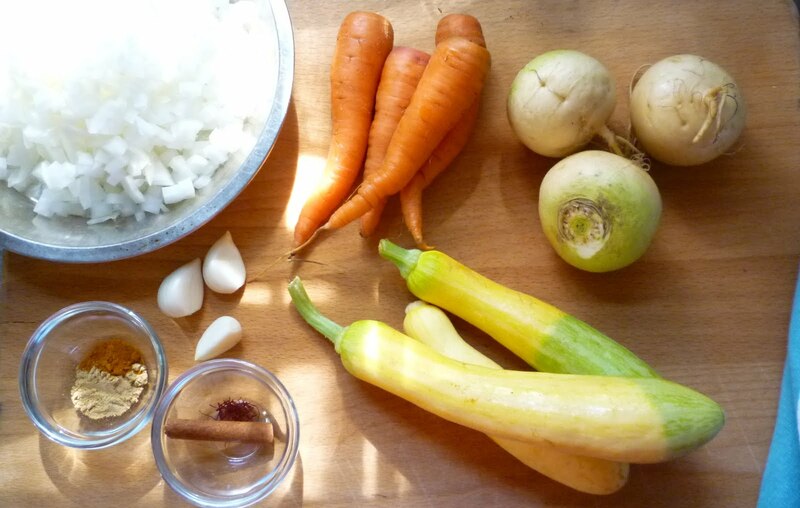 I wrote a stewing basics post several years ago that goes into all the pertinent details. If you are a novice to stewing...or aren't happy with the way your stews turn out...you might take a few moments to read that post. A well made stew or braise is, I think, one of the finest foods around. When I made our stew, I chose to use all chicken drumsticks. If you don't like to eat with your hands, drumsticks aren't the best choice. But if you don't mind, they are perfect...the one end making a convenient little handle. Just make sure you provide plenty of napkins...or even finger bowls of water. 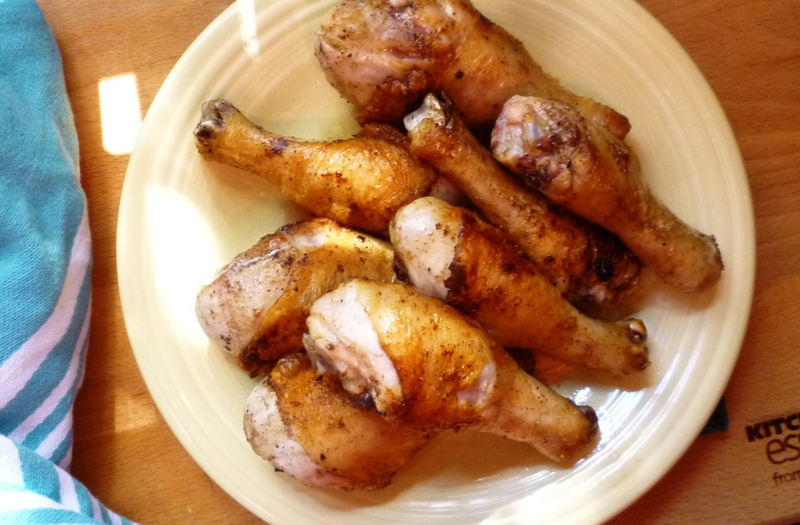 You can also make it with thighs—which are a bit easier to tackle with knife and fork...or are easily deboned in the kitchen so that people don't have to wrestle with bones at the table at all. I would discourage the use of white meat for this stew. You must pull the white meat out when it is just cooked or it will be tough and dry. The vegetables will then have to go on cooking until they are done. The vegetables take 50 minutes to an hour to cook. The dark meat pieces are a perfect match since they will cook to beautiful, flavorful tenderness in just this amount of time. Finally, the choice of vegetable varieties is up to you. I happened to bring home some lovely Gold Ball turnips along with my carrots and yellow squash. The result—when combined with the saffron and turmeric—was what I thought was a fantastically beautiful study in yellows, oranges and golds. But you can obviously make this dish with regular white turnips. And even though I have lumped the carrots and turnips together in the ingredient list, I would encourage you to use roughly an equal quantity of each. The stew will be a bit sweet and one dimensional without the turnips..and will tend towards bitterness without the balance of the carrots. 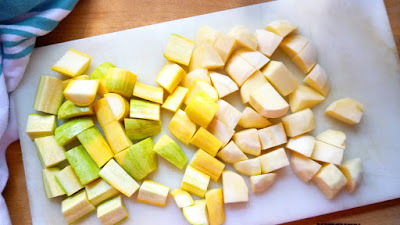 You may also use regular old zucchini instead of the yellow squash. In the fall, you could make this dish with winter—instead of summer—squash. Add winter squash 10 minutes after the root vegetables have been simmering for 10 minutes. Season the chicken generously with salt and pepper. In a large braising pan (wide enough to hold all the chicken and deep enough to accommodate all of the chicken and vegetables) set over moderate heat melt the butter in 1 T. of the olive oil. When the butter is melted, increase the heat. When the butter foam subsides, add the chicken (skin side down if using thighs). Carefully brown the chicken until the fat is rendered and the skin is crisp and golden. Regulate the heat as necessary to maintain and active sizzle without scorching the chicken. 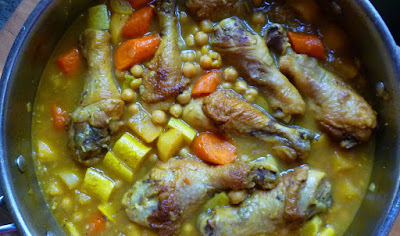 Drumsticks will need to be carefully rotated and will take longer—perhaps 20 to 25 minutes. Thighs will primarily need to be browned on the skin side with only a quick surface sear on the side without skin and will take less time. While the chicken browns, cut the vegetables. Cut the carrots on a short diagonal into 3/4- to 1-inch chunks. Cut the turnips into a rough 3/4- to 1-inch dice. Trim the ends away from the squash. Cut into 1-inch chunks. Remove the browned chicken pieces to a plate. Add the onions to the pan along with a pinch of salt (and more olive oil if the pan seems dry). Cook the onions over moderate heat—reducing the heat if they onions start to brown too much—until quite soft...15 minutes or longer, if necessary. 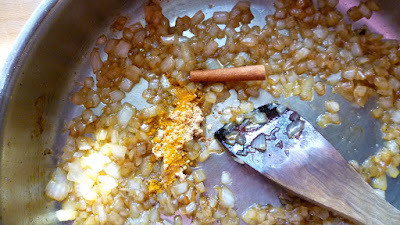 Add the garlic, cinnamon stick, ginger and turmeric and cook until fragrant (about a minute). Add the broth and the browned chicken (along with any juices that have been released as the chicken sits) to the pan. Bring to a simmer. Crumble in the saffron and season with 3/4 t. kosher salt (less if you have used salted broth). Add the carrots and turnips and bring to a simmer. Cover with a tight fitting lid and simmer gently for 20 minutes. Add the squash...making sure all the vegetables are submerged in the broth...return to a simmer, cover and cook another 20 minutes. Add the chickpeas, cover and continue to simmer until the vegetables and chicken are tender—another 10 to 20 minutes. Taste and correct the seasoning. If the dish seems very sweet...or one dimensional...add a squeeze of lemon. Serve with cilantro and parsley scattered over. Pass Harissa separately so each diner can drizzle it on to taste (or...if you prefer...and you know that everyone will enjoy the heat of Harissa, stir 2 T. of Harissa into the broth prior to serving). Serve accompanied by Apricot & Pistachio Couscous. Place the couscous in a medium sized bowl. Add the salt and apricots and toss to combine. Cut the butter into chunks and scatter over the surface. Bring the water to a boil and pour over, swirling the bowl gently to make sure the water penetrates all of the couscous. Cover tightly with plastic wrap and let stand for 10 minutes. Uncover, add the pistachios and cinnamon and fluff with a fork. Taste and correct the seasoning. Toast whole spices and chiles in a dry skillet until fragrant, then cool. With an electric spice grinder, a cleaned coffee grinder, or a mortar and pestle, grind seeds and chiles fine. Transfer ground spices to a small food processor and add garlic and salt. Grind mixture to a paste. Add roasted pepper, tomato paste, and oil and process until smooth. The harissa will keep, covered in a jar in the refrigerator, for weeks. It is HOT, savory and delicious. 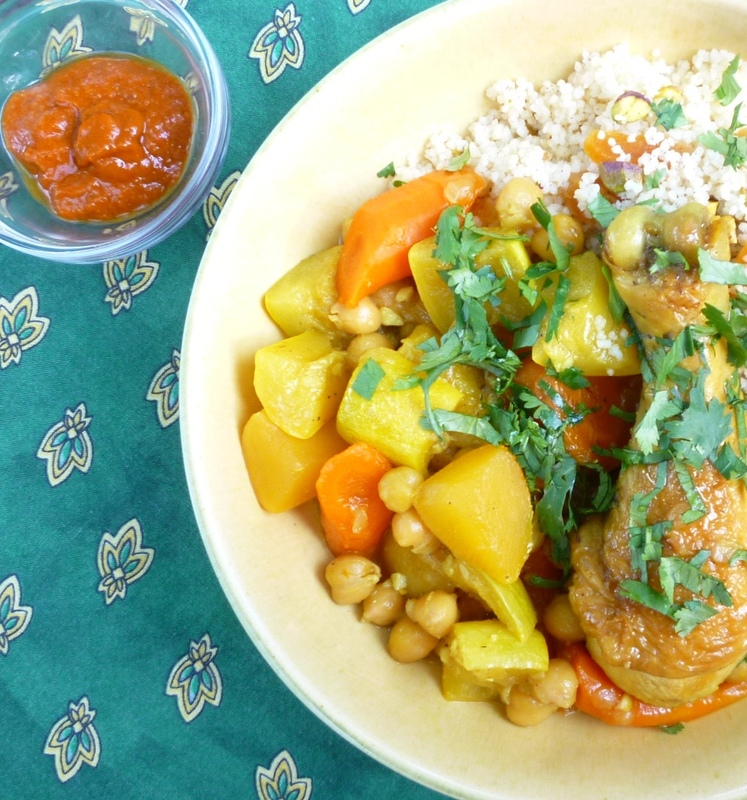 Serve as a condiment with couscous and tagine. Makes 1/2 cup. I use a rounded measure for each of the spices...and I remove the seeds from half of the chiles. If using a spice or coffee grinder to grind the spices and chiles, let the grinder sit for a moment or two before opening to allow the spices to settle. If you open it right away some of the spices and more significantly some of the chiles will be airborne—which will irritate your eyes and nose.